Do you have chickens on your property that free range? Keeping chickens is a lot of work and you need to have certain things set up like a chicken coop. However, chickens that are more like pets might need a way to keep warm when outside. A perfect option may be DIY chicken sweaters. 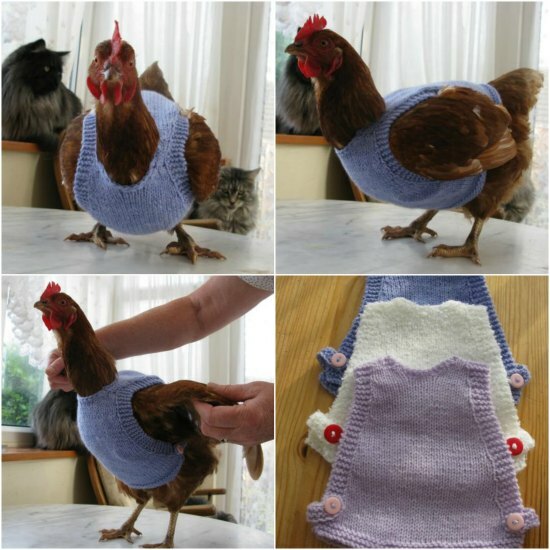 Making DIY chicken sweaters is really similar to making a sweater for a dog or other pet. You need an assortment of supplies like yarn or fabric for the type of sweater you want to make. The best option for you to use for this project will be double knitting yarn. The best thing about DIY chicken sweaters is you can make them to use as a gift. They are an item that is simply adorable and will keep chickens warm in any cold environment. Buttons can also be added to the sweaters to make them unique or personalized.